Responsive Web DesignDomino theme design seamlessly reshapes itself without any loading delay. Moreover, sections of content are organized in a mobile-friendly design pattern. Color schemesChoose one of the three color schemes for Domino: blue, orange, and grey. The design elements throughout the website (panels, text, headers, links, hovering, buttons) will be changed automatically. Customizable panelsGive a unique feel to the content on your website with our carousel and sliders. Domino features panels that are seamlessly “integrated” into design and give you space to implement your own ideas. Sliders for collectionsWhether it is a collection of news, events, images, offers or products, you can use our neat slider to display them in portlet on any section of your website. 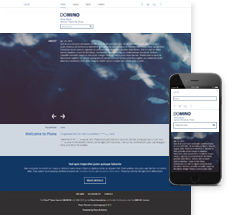 This subsite features Domino Plone theme. Use a drop down at the top of the page to select the demo parent site or any site with other theme. Theming settings for Domino can be changed separately for this child site and will not influence demo website in general. Looking for the sophisticated and lightweight Plone themes? You’re in the right place! Browse and search our many themes and discover the one that is just right for your business. Domino is an elegant businesslike theme for Plone based websites. It introduces balance between eye-catching and formal. Domino has three color schemes: blue, orange, and grey. Calm, bold, classic - choose the one that complements your business concept. Domino delivers minimalist, clean, and mobile-friendly design that will promote your web presence. Activate the extensions to add features you need: fancy carousel, drop-down or mega drop-down menu, custom sliders for collection, panels, multilinguality, and more. Everything can be customized: icons placement on the page, name of the portlet, number of buttons for those social media platforms you are present on, and links for specific icons.